Introduction to Silvia Karman Cubiñá. 2:58 min. Music: Tony Succar. Photo & Design: Raymond Elman. The Bass is Miami Beach’s contemporary art museum. Focusing on exhibitions of international contemporary art, The Bass presents mid-career and established artists reflecting the spirit and international character of Miami Beach. The Bass seeks to expand the interpretation of contemporary art by incorporating disciplines of contemporary culture, such as design, fashion and architecture, into the exhibition program. The exhibition program encompasses a wide range of media and artistic points of view that bring new thought to the diverse cultural context of Miami Beach. The Bass Museum of Art opened in 1964 through the donation of a private collection by John and Johanna Bass to the City of Miami Beach. The museum opened in what was formerly the Miami Beach Public Library and Art Center, a 1930s Art Deco building designed by Russell Pancoast, grandson of Miami Beach pioneer John Collins. The building itself already had a rich history on Miami Beach as the first public exhibition space for art in South Florida, and was placed on the National Register in 1978. In 2001, the original museum building was renovated, and a new wing, designed by renowned architect Arata Isozaki, was added to house galleries, offices and a museum shop. The new galleries gave the museum a total of 16,000 square feet of exhibition space, essential for the presentation of temporary exhibitions and continued growth. In 2009, The Bass experienced another wave of institutional growth as it consolidated its governance in a 501c3 non-profit corporation, hired a new director, Silvia Karman Cubiñá, and developed a new board. The museum re-focused its mission and programming to reflect the new development of Miami Beach as an art destination, catering to the evolving and diverse nature of Miami Beach residents and tourists. In 2017, The Bass concluded a comprehensive transformation and reopened to the public on October 29, 2017. Again working with architects Arata Isozaki and David Gauld, the renovation expanded the internal structure to create an almost 50 percent increase in programmable space, including four new galleries, a museum store and cafe, and a designated education facility to better serve expanded programs and increased attendance. When did you become passionate about art, and when did you start to think of art as a career path? INSIGHT & INSPIRATION: 1:23 min. Where did you go to school and what did you learn that still informs you today? EXPOSURE TO BROAD INFLUENCES: 1:51 min. You have held a lot of different positions in the art world. How did your past jobs prepare you for your current position at The Bass? INSIGHT & INSPIRATION: 1:33 min. You worked with Rosa de la Cruz and Craig Robins at the Moore Space (2002-2008). What was that experience like and how did it change when you moved to The Bass? Did you have to apply for a job at The Moore Space? RESPECTS OTHERS POINTS OF VIEW: 0:48 sec. OVERCOMES CHALLENGES TO SUCCEED: 1:21 min. VALUES FIRST-RATE EDUCATION: 0:53 sec. What is the proper role of universities in developing curators and museum directors? UNDERSTANDS THE BUSINESS OF ART: 2:50 min. What are the opportunities and challenges for The Bass? UNDERSTANDS THE AUDIENCE PERSPECTIVE: 2:09 min. How do you leverage technology, and how do you stay true to the mission of exhibiting the founding collection? What are your criteria for new acquisitions for the Bass collection? INSIGHT & INSPIRATION: 1:28 min. 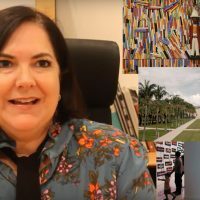 What are your thoughts regarding the future of Miami as a major international art community? VALUES FIRST-RATE EDUCATION: 1:55 min. Describe some of The Bass education programs that you find most exciting.